Photo: kraftrecipes.comMarch 6, 2019 (EcoSophia.net) -- I’m sure many of my readers noticed that last month’s posts were talking about the same thing from two different angles. The first of those posts looked at the weird conviction on the part of America’s well-to-do classes that the people below them have no right to their own reasons for, say, voting for a candidate the well-to-do classes don’t like. The second explored the equally strange conviction, mostly on the part of these same well-to-do classes, that nature must not be allowed to clean up our messes, adapt to climate change by moving plants and animals to new bioregions, or indeed to respond to any of our actions except in a purely passive way. These odd convictions are by no means the only examples of the phenomenon I have in mind. Back in the days of The Archdruid Report, to cite another, I talked about the frankly bizarre way that the U.S. political class chattered about the upcoming “surge” in Afghanistan, laying out in detail exactly what the U.S. military was going to do, as though nobody in the Taliban could possibly boot up a computer, read the New York Times, and take our plans into account. It’s all very reminiscent of those Russian generals in the First World War who insisted on sending orders to the units under their command over the radio, unencrypted, in the serene certainty that the Germans couldn’t possibly be listening. The Germans, who of course were listening, crushed the Russian armies in battle after battle; the Taliban, who were in less of a hurry, simply sat back, fixed coffee, and waited for the “surge” to exhaust itself, as it promptly did. There are some even better examples in recent news, but I’m going to leave that aside for the moment and veer into philosophy. That’s not a diversion, though it may look like one. It leads straight to the cold festering heart of the predicament of our time. As I was saying, as you look at the coffee cup, you’re aware of two things: the coffee cup, and yourself looking at the coffee cup. Take a moment to make sure of both of those. There’s the cup, in front of you; and there’s you -- you know, for example, how far the cup is away from you, and what angle your eyes are at as you look at the cup, and just how bored and mystified you are by this little exercise, and so on. The act of looking at the cup brings both the cup and yourself to your attention. Can you stare at the cup so intently that you forget yourself, and can you become so caught up in your own thoughts that you forget about the cup? Sure, but we’re talking about the range of experiences in between those extremes. More broadly, most of the time when you’re awake, you’re aware of two classes of things, which are typified by the coffee cup on the one hand, and your act of attending to the coffee cup on the other. For convenience, we can call these two classes of things the outer world and the inner world. The outer world contains coffee cups, platypuses, spiral galaxies, modern art, and much more; the inner world contains thoughts, feelings, memories, sensations, and much more. The zone of interaction between these two worlds is your body, which you can experience in terms of either world. You can look at your hand the way you look at a coffee cup; you can feel your hand the way you feel an emotional state. Under ordinary conditions, your body is the only thing that allows this kind of overlap. You can’t feel a coffee cup from within or look at one of your own emotional states from outside. (You can look at the expression on your face, or what have you, but that’s not the same thing.) So you have two worlds, an outer world that includes your body, and an inner world that also includes your body; to put the same thing another way, you have two ways to encounter objects of your experience, one that perceives the things we’re calling “outer” and one that perceives the things we’re calling “inner,” and your body is the one thing you can perceive in both ways. It’s very common, and not just in today’s industrial societies, for people to go looking for ways to insist that only one of these two worlds is real -- that the outer world really is what it appears to be, a world of material objects, in which the inner world is a sort of irritating ghost if it’s allowed to exist at all; or alternatively that the inner world is the only reality and the outer world is a sort of irritating ghost that’s projected from it. It’s also possible to argue that each world we experience is an aspect or reflection or way of looking at one and the same world, and we’ll be talking about that in due time. For the time being, though, I’m going to ask you to bracket all such speculations, and pay attention to the two worlds as you experience them naively, without benefit of abstract theories about what is and isn’t real. There’s a crucial difference between the two worlds that you experience, and it’s something you spent the first months of your life figuring out: you can do things with your inner world that you can’t do with your outer world -- at least not in the same way. 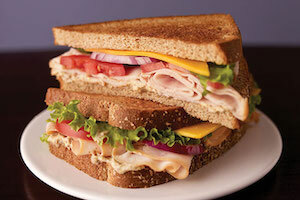 Imagine a turkey sandwich with lettuce and tomato on rye bread. Take your time making the image as clear as possible, and bring in other imagined senses, so you don’t just see the texture of the bread slice and the complex curves of one end of the lettuce leaf sticking out past the bread. Let yourself smell the bread, the turkey, the mayonnaise, and the rest of it. Imagine yourself running a finger across the top of it and feeling the texture of the bread. Imagine yourself picking the sandwich up in both hands and taking a small bite: feel the way your teeth go through bread, lettuce, tomato slice, meat, and experience the taste. Now imagine yourself setting it back down on the table -- and imagine that it suddenly wobbles, rises up slowly into the air, slips out through an open skylight directly above you, and soars into the sky like a balloon until it’s lost to sight. All that took place in your inner world. If you want a turkey sandwich to manifest itself in your outer world, by contrast, it’s a much more complicated process. You have to go to the fridge and the pantry to get the ingredients, and if you don’t happen to have the ingredients on hand, you may have to walk down to the deli to get them; if you have no money, you may have to get a job and earn it; it’s just conceivable, if something really improbable has happened while you were imagining a turkey sandwich, that you will have to plant a garden with tomatoes and lettuce, plow a field to grow wheat and rye, get some chickens laying to provide you with eggs for the mayonnaise, and go hunt a nice plump tom turkey, before you can have your sandwich. So we’ve established that whatever the theoretical reality underlying it all might be, we each experience two worlds, with the body as a zone of overlap between them. Now we can go on to the next step, which is the presence of comparable inner worlds in at least some of the things we encounter in our outer worlds. It’s important in this context to remember a point the philosopher Michael Polanyi made in his books Personal Knowledge and The Tacit Dimension: we know more than we can prove. The example Polanyi uses is the ability to recognize familiar faces in a collection of photographs. You flip past fifteen photos of complete strangers, and there’s a photo of your Aunt Mabel. You know that at a glance, and anyone else who knows Aunt Mabel can confirm that you’re correct -- but there’s no way to prove the accuracy of your perception to a person who has never seen Aunt Mabel, short of dragging that person to her house. We know more than we can prove. The eliminative reductionists mentioned earlier, poor meat robots that they are, make use of that fact to raise defensive barriers around their theories. You can’t prove that the people around you have inner worlds like yours, nor can you prove to another person (or for that matter a meat robot) that you have an inner world, and so the meat robots can go on insisting that you can’t experience what you do in fact experience at every waking moment. Prove them wrong! You can’t prove it, but you can experience it. If you’ve ever watched someone die -- I have, more than once -- you know what I’m talking about. There’s the final plunge of the vital signs, the ugly rattling noise as the lungs empty for the last time, the equally ugly brown-gray color spreading over the skin as the blood vessels lose their tone and the blood sinks to the back of the body…and then, unmistakably, something is not there that was there a moment before, and what was a person becomes an object. That was a common experience back when most people died at home in the company of their loved ones, and it’s one of the things that explains the widespread belief in the existence of souls. In turn, it’s the odd habit we have of locking away dying people in institutions, I think, that gives the meat robots what plausibility they have. There’s a certain irony in the fact that I’m pointing this out. I have Aspergers syndrome, and one of the very common consequences of that bit of scrambled neurology is that it’s harder for me to notice the traces of the inner world in others than it is for most other people. I’ve sometimes wondered if the tendency for people with Aspergers syndrome to go into the sciences has a lot to do with the popularity of notions like eliminative reductionism; it could all amount to a bunch of blind men insisting in angry tones that there can be no such thing as color. Still, that’s a discussion for another day. There are other experiences that tell us that the people around us have inner worlds more or less like ours, and it’s a curious detail of our existence that none of them seems to be subject to proof. Most people who’ve been deeply in love have had the experience of inner worlds brushing against each other; the same thing can happen, oddly enough, in martial arts practice, when you and your partner-opponent become part of something larger, and the first one to lose the rhythm of that larger process is the one who gets flung to the mat. Some of my readers may be able to think of others. None of them can be proven to those who weren’t there at the time, and so a certain class of pseudoskeptic thinkers can join the meat robots in insisting that those experiences can’t be real because you can’t prove they were real to someone who is dogmatically opposed to admitting their reality. If you were there, on the other hand, you know. So in every interaction with another person, we have three worlds, not two. There’s your inner world, dear reader; there’s the outer world, which you and the other have more or less in common and which, in a certain sense, bridges the gap between you; and then there’s the other person’s inner world. You know that this third world is there, even though you can’t prove it to the satisfaction of a meat robot; you can only glimpse it from time to time and can never know it the way the other person knows it. One of the ways you know it’s there, though, is that other people behave in ways that can’t be predicted by simple cause-and-effect logic. Back in the halcyon days when I studied systems theory at Huxley College of Environmental Studies, our textbook used a helpful illustration to make that point. Imagine a six-foot log and a six-foot man, both standing on end. If you push on the log and put enough force into the push to overcome its inertia, it falls over. If you push on the man, things aren’t so simple. He may step suddenly to regain his balance; he may get irritated, and shove you in return; he may even see your push coming and do the t’ai chi move of twisting out of the way at the last moment, leaving you to tumble forward on your face. What’s more, even if you know him fairly well, you may not be able to predict which of these things he’s going to do. In systems theory, that illustration was used to make the crucial point that systems don’t just sit there and respond passively to whatever we do to them. They can act to regain their balance; they can push back; they can even learn to anticipate what we’re going to do, and forestall us in some more or less sneaky manner. That’s not just true of humans, either. Any sufficiently complex system can do all of these things -- a point that led systems theorists such as Ervin Laszlo to postulate that what we call consciousness is what systems complexity looks like from the inside. So we’ve got a world that’s made of many worlds. We’ve got an outer world that we more or less share in common, and inner worlds which are more or less unique to each of us, and it’s the presence of an inner world in other things that generates the basic cussedness of the outer world. The more of an inner world something has, the less likely we are to be able to predict and control its behavior, and the more likely it is to do something we don’t expect and don’t want. Notice, though, that by and large it’s only things in the outer world -- and only certain things in the outer world -- that behave in this fashion. You can imagine that turkey sandwich any time you like, and send it and all its kin soaring away into the stratosphere, and the turkey sandwich isn’t going to argue with you. When it comes to your thoughts and feelings, that’s a more complex matter, but most of us (other than the meat robots, of course) have had the experience of choosing to rethink something, or examining our initial feelings about something and deciding that we were wrong. This sort of thing is useful to do, in moderation, for certain purposes. Children do it relentlessly in play, and it’s good for them; Jungian psychologists call it active imagination, and use it as a potent tool for therapy; most creative artists in every medium use it; in operative occultism, it’s called scrying in the spirit vision, and it’s an essential skill that you’ll practice by the hour if you follow that path. On the other hand, it’s not without its dangers. If it gets out of hand and your inner life ends up with its own inner life 24/7, well, that’s called a psychotic break, and you end up pumped full of sedatives in a mental ward. Equally, it’s possible to make things in the outer world behave as though they don’t have an inner life of their own. Again, this can be a useful thing to do, in moderation, for certain purposes. Equally, it can get out of hand, and you can lose the ability to notice the signs of inner worlds throughout your outer world so that you become convinced that the things around you have only the meanings you give them, and ought to react with the rigid predictability of a log stood on end. That’s a different kind of craziness than, say, acute paranoid schizophrenia, but it’s just as crazy -- and it’s a craziness we spent two posts discussing last month. There’s a wrinkle to this second kind of craziness, though, and it comes from the fact that we don’t just perceive the outer world; we also shape it through the medium of our bodies, and the tools our bodies can use. It’s quite possible to set up conditions in the outer world so that the inner lives of other people and other things are made more easily perceptible to you. It’s just as possible, in turn, to set up conditions in the outer world so that the inner lives of other people and other things are hidden from you, so you don’t have to take them into account. We even have a word for a portion of the outer world that has been wrenched into a shape that gives it no way to express whatever inner life it might have, so it will do exactly what we want, and only what we want. Thus it behaves in our outer world the way that imaginary turkey sandwich behaves in the inner world. The word I have in mind is “machine.” We’ll discuss that, and much more that unfolds from it, in posts to come. 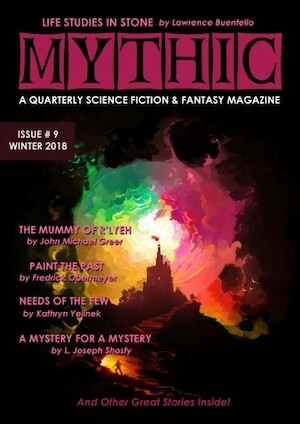 On a topic not wholly unrelated to the theme of this post, the latest issue of MYTHIC Magazine, this blog’s favorite independent journal of science fiction and fantasy, has just been released in e-book format. You can get your copy ; better still, you can subscribe ; and best of all, you can support the magazine via its Patreon page .